The item Senseless, (electronic resource) represents a specific, individual, material embodiment of a distinct intellectual or artistic creation found in San Francisco Public Library. An outrageous comedy about two college students who'll try anything to get ahead! 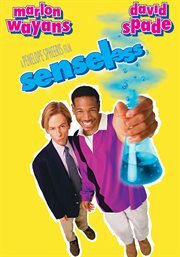 Perpetually poor Darryl is destined to lose his dream Wall Street job to a wealthy snob...until he volunteers for a scientific experiment that gives him superhuman senses - and the competitive edge he needs! But when the side effects start, he finds his chances for success sabotaged by attacks of sensory overload!